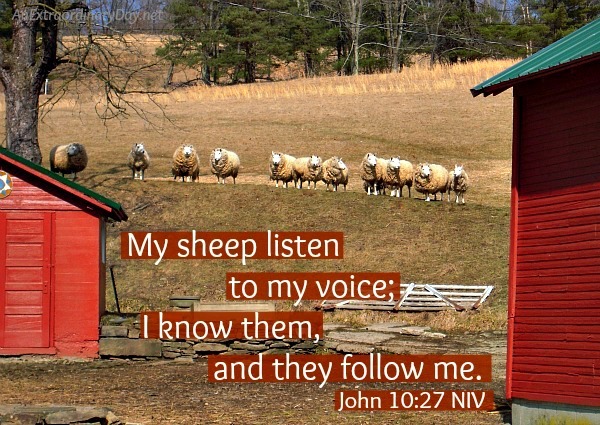 My Sheep Listen to My Voice | JoyDay! You see, one day as Tim and I went for a long walk in the country, we noticed a good number of sheep scattered all over the hillside. They were happily grazing near the farmhouse and the adjacent field. As we got closer I started talking to them. I’m friendly like that. I’ll talk to horses and cows and maybe your dog. Though I am afraid of dogs I don’t know. When I talk to animals I don’t really expect that they’re going to respond to me. After all I’m a city girl. I have no large animal experience. My only pets have been cats. There were a few dogs that tried to call our house home, but usually after a few days my dad would put them in the car and take them to the humane society. How I got brave and started talking to animals along my walks, I’m not sure. But, I do enjoy it. I just hope no one besides the animals and my husband are listening. Yet, they are really paying attention to me. I won’t tell you what I said… I’ll just leave it up to your imagination. However, I did NOT call, “Here sheepy!” Just for the record. But, then… the sheep started making their way down the steep hill… coming my way. There was something in the barn calling them. I wonder what was going on in the barn? Evidently it wasn’t what they expected… because they sent out a scout to find me. I guess they ignored him. They probably wondered for a long time, because I continued on my walk. They were still milling around the barn on my return trip. 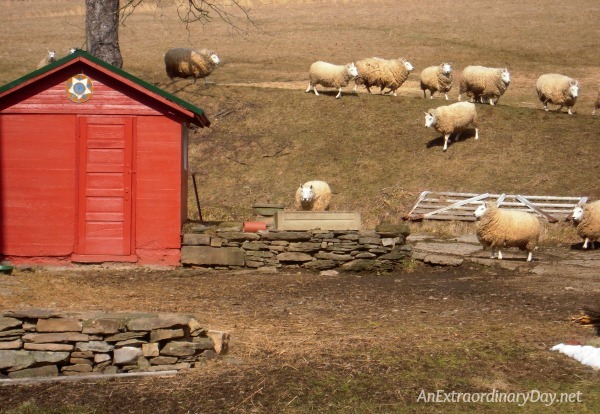 And as I walked… some of the sheep got the idea that they needed to head back inside the barn. As I continued on my way… some watched me quite inquisitively. My little adventure reminded me of this scripture…. How often do I listen to the ONE who loves me with His everlasting love… briefly follow and then go my own way… thinking that I’ve got things figured out… without keeping my eyes on him? being warm and cozy in the house when the temperature dropped to -19.
renewing our hope and admonishing us to fully trust and believe through a devotional passage we have read countless times. Thank you for helping us see your word in a new, fresh, and powerful way. safety on the roads this week with all the snow. that our car started right up in spite of the intense cold. the blessing of my husband making a hot breakfast every morning. a ridiculous amount of time used up on trips and phone calls to resolve an issue that still has us “on hold” for another week or so. In the midst… you’re making something better out of this for us. I’ve taken this weekly counting to a daily counting of ten. Each night… the last thing I do before I go to bed is pull out my journal and list all the things for which I am grateful. My count has now passed 500. There are plenty of pages in my journal to count thousands and thousands. I look forward to filling it up. If you have never taken on a discipline like this… I encourage you to give it a try. It has made such a huge difference in my life. We’re now in the season of Lent. If you’re want to give up something other than Coke, chocolate, or Facebook, you’ll want to read this post. (Even if you have given up one of the three… check it out anyway.) And if you are looking for something to do or read daily, I shared some options here. Thank you for taking the time to share your walk with us this morning. I live in Baltimore, Maryland and we got about 10 inches of snow yesterday. Church has been cancelled and it was cancelled last week, too. So hearing about our Good Shepherd is a balm to my heart. Three years ago I began decorating with sheep because they remind me of my Shepherd. I do not ever want to stop hearing or responding to His voice. He has never led me astray. May you and yours have a blessed day. Again, thank you. Oh Lorraine… I am so sorry that you are dealing with so much snow. That’s something I would be used to in NY and MI and it still would be a pain… but you don’t ever get snow like that, do you? I love how you decorate with sheep as a reminder. Thank you for stopping by and for leaving your kind words. I am so grateful for my wonderful husband, alway wanting to make me happy – he is such a good man. I am grateful they both went to visit my Mom yesterday, this is so important they spend time with their grandma. I am grateful for the talents God has given me. Did I ever think I would be making jewelry, NO – but with His grace I have learned how to, and I love doing it. I am always grateful for my 7 sisters, as I shared last week. I am grateful for my new friends I have made living in our condo. I rejoice with you, Rose, and love your grateful heart. Thank you for such beautiful words. I wish you so much peace and love. 3. for my Faithful, Christian Friends who have uplifted and surrounded me in prayer as I face one of the greatest challenges I have ever faced in my life tomorrow…. my Earth Angels ! 4. for my Home that I Christened SOZO on August 2,2014 after reading about it in one of my favorite blogs. It is Greek meaning , to save, keep safe and sound, to rescue from Danger and destruction, complete restoration….which is what I am believing for. In the Blog she recommended giving your Home a name and an identity. It will help you to value and take pride in it… This is what she named her home and I borrowed it because it so fits my situation! Looking forward to seeing how God works on your behalf. Thank you Lord for meeting my friend’s need and taking care of her!!!! I loved your post!! I grew up in the country and we had some sheep at one point. We didn’t have a farm, just a big back shed. I spent a lot of time at my cousin’s farm which had Holstein cows. So many memories! You wonder what is going on in their sheepy brains when they’re looking at you like that. A great message too. I know I’ve been like them. I heard His voice and went traipsing my own way. Thanks for that. Having an extra day off this week to get more things done. Finding curtains that I saw on another blog that I knew would look perfect in my home. Never had curtains! Just blinds. Like many, having a warm and cozy home when it is super cold out there! Being able to bless some sweet young ladies with an encouraging card while they were encountering God at church this weekend. Being able to bless a friend on her birthday when no one else did and sharing a wonderful conversation. And like Rose said above, finding so MANY bloggers who know Jesus!! They’re everywhere! I agree, Diane, it’s such a joy to find so many wonderful, talented, articulate, and brilliant, fellow Jesus lovers in blogland! Thank YOU for not only stopping by… but for taking the time to share a little of your story and to “count” with us. -Thankful for my shepherd and that He has shown me His voice and love. -Thankful for a warm house. -Thankful for God’s work in the lives of our family members. -Thankful that He allows me to take part in new ministry areas. -Thankful for each encouragement along our journey. -Praising the Lord for His love and care. Haha! Kim, I think you’re probably right. 😉 I bet they would rather eat oats (or whatever sheep eat) than the dry bristly stubble in the fields at the end of the winter. 🙂 Regardless… it was a FUN adventure and one that made my day. I so enjoyed taking all those photos, wondering what I was going to do with them. Would you believe that experience took place two years ago in March? That seems a life-time away. I was going through some of my old photos that I haven’t used on the blog and came across those. What a wonderful memory on a subzero day!! Thank you for stopping by today and sharing your ‘seven,’ too! I love your thankful heart and rejoice with you for God’s wonderful provisions. I so enjoy hearing you express your faith. It is so rare these days for one to do so. I am inspired! Thank you! Oh now….see, if it were me I WOULD have been calling “Come ‘ere little sheepies!” LOL. What adoreable photos. Gotta wonder about that barn though…..I can guess the farmer with the shears wasn’t in there. They’re fluffy sheeps! Enjoy your Lenten season, ashes or not. Haha!!! Aren’t they the fluffiest things ever?!! Thanks for the kind wishes, Mel!